I get a ton of requests to do product reviews on the blog….at least a few each week. And yet I only do 3-4 each year. This is because I’m only interested in reviewing products that are extremely relevant and potentially really helpful to parents of fussy babies. This means that when I agree to do a review, I’m already pretty sure it’s going to be a good product. However, I don’t always know exactly HOW good it’s going to be. Disclaimer: This is a sponsored post, which means I received compensation for writing it. However, as noted above, I only review products that I truly believe will be helpful for parents…my reputation depends on it. A bit of background on the product might be helpful before we jump into the reviews. 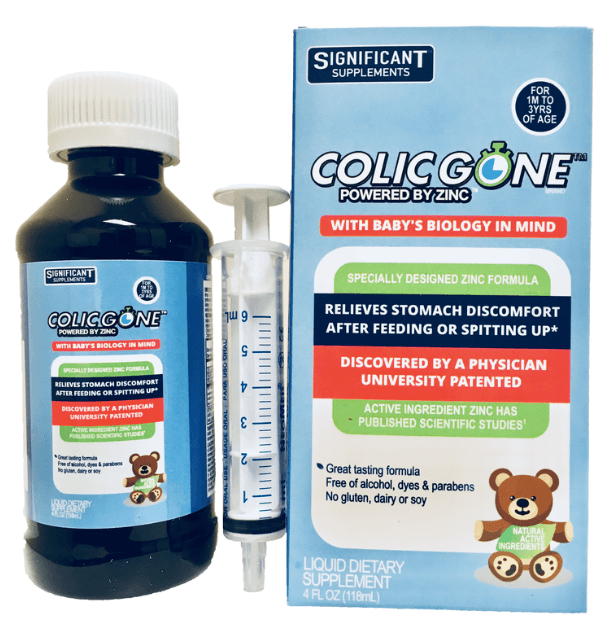 Colic Gone is a new supplement specifically designed to address reflux and reflux-related colic. Its active ingredient is Zinc, which has been shown to reduce acid production. Since some research has shown that the levels of zinc in breastmilk decreases by around 50% between week 2 and 4 months postpartum, it makes sense – at least in theory – that these lower levels of zinc could potentially be at least contributing to colic or reflux. Based on these promising studies, Colic Gone was born. Colic Gone is given by dropper 4x/day. It’s free of alcohol, dyes, gluten, soy and parabens, and is manufactured in a medical grade facility; which means it does not come into any contact with allergens like dairy, soy or nuts. 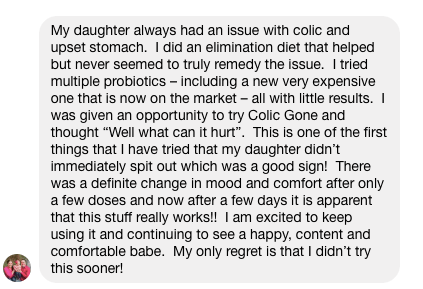 When David Kolb, the founder of Colic Gone, approached me many months ago about possibly doing a review, I have to admit I was skeptical. The research on similar products (I won’t name names) has typically shown little to no improvement after use, so I wasn’t sure Colic Gone would be any different. However, after learning that Colic Gone was developed in partnership with Yale University, and that it had solid academic research it back up its effectiveness, I figured it was worth a try. 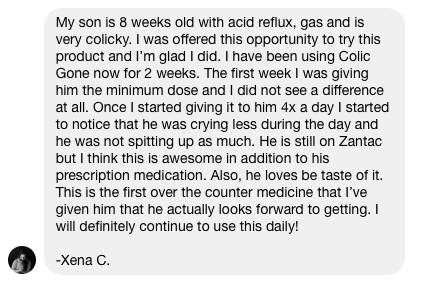 Since my own kids are almost-12 and 14, I put out a call to members of our Facebook group to find moms with babies (aged 0-12 months) who had colic OR reflux, and who wanted to test the product. I found it interesting that David specially recommended asking for reviewers who had already tried a number of other products – like gripe water, probiotics or even reflux medication like Zantac. 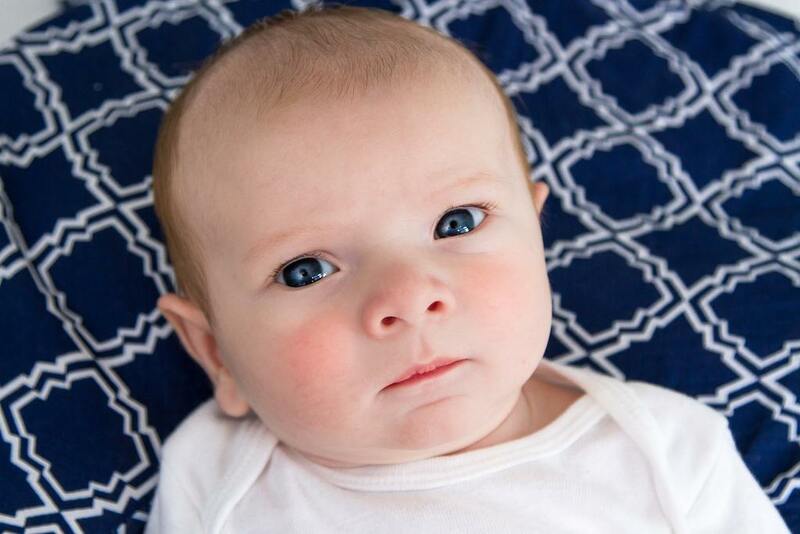 He wanted to show just how much more effective Colic Gone would be for reflux and reflux-related colic….especially compared to the usual treatments. 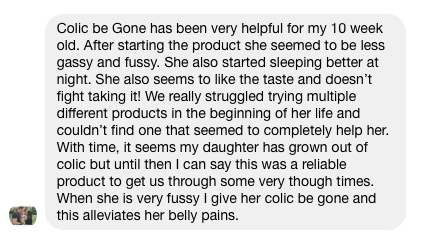 Our 8 reviewers began testing out Colic Gone in mid-June, 2018. Final results: Of the 8 reviewers, I received feedback from 7. As of the date of this review, one reviewer has not used the product consistently so did not provide a review. One reviewer discontinued the product after 4 days due to a rash. 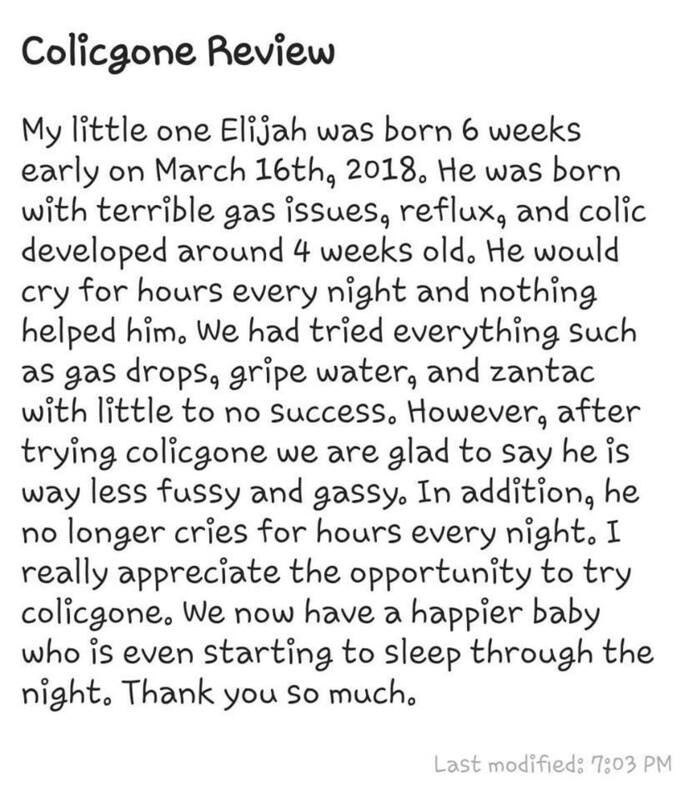 She confirmed her son does has allergies, and while Colic Gone is produced in a medical grade facility (meaning it doesn’t come into contact with any allergens), this reviewer understandably decided to discontinue use and consult with her allergist at their next appointment. Following are the 6 written reviews I received back. These are unedited. Obviously, I can’t promise you’ll see the same results as our reviewers. However, if your little one suffers from colic or reflux, I’d recommend trying Colic Gone based on the reviews I’ve received above. 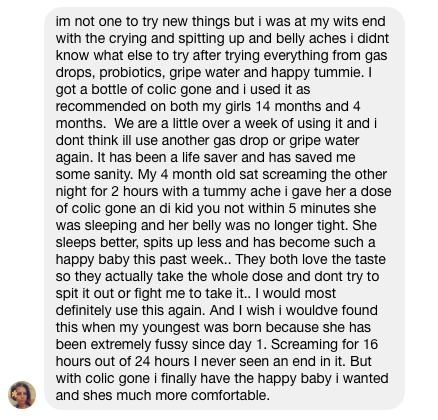 To find out more about Colic Gone, including the research behind the product, or to order a bottle for yourself, click the link below to visit the Colic Gone website.